The opioid crisis claimed the lives of more than 20,000 Americans in 2016. The drug Vivitrol was developed in order to address this growing problem concerning deaths from opioid overdose and abuse. Vivitrol is a drug that helps those recovering from addiction prevent relapse. It is an extended release, injectable form of naloxone, which acts as an opiate antagonist. What this means is that it essentially blocks the effects of opioids on the brain. It was initially approved by the FDA in 2010 for treating addiction. Vivitrol was the first non-narcotic, non-addictive, extended release medication approved for this kind of treatment. This is an “agonist” drug that binds to the body’s opioid receptors and activates these receptors in the same manner that an opioid might. It is offered at many certified treatment facilities, and is usually administered in liquid form for daily use. Methadone has been used for decades to treat people who are addicted to heroin and narcotic pain medicines. When taken as prescribed, it allows people to recover from their addiction and to reclaim active and meaningful lives. 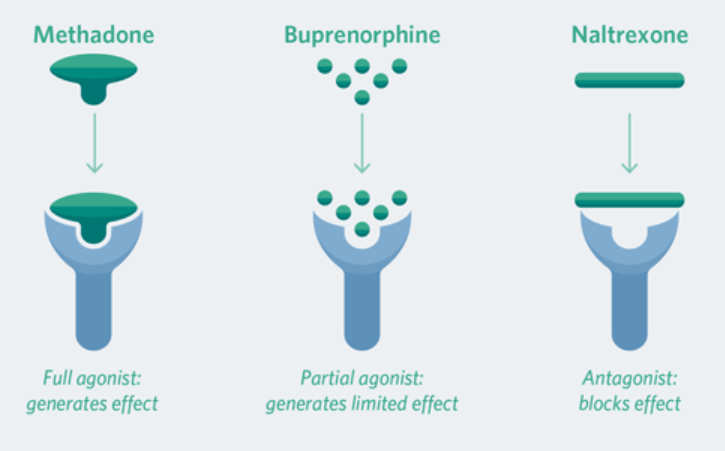 Suboxone is a combination of two different drugs: buprenorphine (an opioid activator) and naloxone (an opioid antagonist). This combination of opposing forces provides a way for addicts to gradually wean themselves off of their pre-existing addiction while minimizing the effects that full on withdrawal would otherwise trigger. Suboxone is administered with a light film or pill and is indicated for treatment of opioid dependence and should be used as part of a complete treatment plan to include counseling and psychosocial support. Vivitrol is an “antagonist” that binds to opioid receptors, but only blocks them, stopping the effect of other opioid drugs. It can be prescribed by any health care provider and is taken as either a daily pill or a monthly injection. If you have used opioids or opioid-containing medicines prior to taking Vivitrol, using opioids in amounts that you used before treatment could potentially lead to overdose and death. Vivitrol is safer than Suboxone and Methadone because it cannot be abused to achieve a high like the other two drugs can. This is because of its antagonist nature. Vivitrol is not addictive, and you cannot overdose on it. However, if you take opioids while on it, you run the risk of possibly overdosing. Vivitrol can only be administered by a doctor in a controlled environment, and the injection occurs only once every month. Methadone and Suboxone on the other hand can be taken illegally. Vivitrol is more convenient, you only need one visit to the doctor a month as opposed to daily methadone clinic visits or taking suboxone daily. Is Vivitrol a Safer Alternative Than Methadone and Suboxone? Vivitrol, like all forms of naltrexone, works by blocking the opioid receptors within the brain. The medicine binds to these receptors like glue and remains on them, ensuring that no high is attainable from taking another opioid. This is in contrast to medications such as methadone and Suboxone which induce a mild euphoria from using. The drug is administered in only one dose, 380 mg, and must be administered by a clinical professional. The shot is taken once a month, and acts on extended release over that period, continually delivering medication. Prior to taking the drug, the patient must be opioid free for a minimum of 7-10 days. The concentrations slowly decline a couple weeks after injecting. The drug is used for alcohol and opioid dependence. What makes it safer to use is that, unlike methadone and suboxone, Vivitrol is not a controlled substance, meaning it can’t be abused and there is no black market for it. It wasn’t until researchers created an injectable, long-acting version that clinical studies showed the drug’s promise. Vivitrol has been tested in a six-month double blind study, where people who used Vivitrol with counseling to treat alcoholism had a greater reduction in the number of relapses, and more time spent abstinent from alcohol. However this doesn’t mean Vivitrol is entirely without its risks. it can be dangerous when patients are given Vivitrol but still attempt to get high on opioids or consume alcohol. This is because the blocking effect may lead to the patient over indulging in order to attain a high. This is similar to a person high on benzos attempting to get drunk. They will only consume more and more alcohol without achieving the tipsy feeling, and run the risk of overdosing. Read the detailed side/adverse effects of Vivitrol. As with any recovery treatment medication, many scientists and psychiatrists caution against labeling Vivitrol as a magic bullet or overstating its efficacy. It’s not the sole factor that can decide the outcome of treatment. However, taking the shot monthly can be extremely helpful for those facing daily cravings for opioids or alcohol. In one study conducted over 6-months, patients were given monthly injections of Vivitrol along with counseling against a different group taking a placebo with counseling. Patients were given drug tests to ensure they were not mixing substances. Though many participants did drop out of treatment, 36% of those in the Vivitrol group succeeded in total abstinence from opioids, compared with 23% in those treated with a placebo injection.